Who do we blame for JFK’s Assassination? As the election of 2016 is well underway, and the candidates of both major parties have been selected, I think it would be a good time to see how a debate should go. In the coming weeks we will see two candidates with different views on issues square off. The bickering between them both will be highlighted and the real issues put to the side. I think it is a good time to watch the first televised debate, where two candidates were respectful to each other and were able to showcase their views. The two candidates we have in 2016 have been going at it for months, but in the end, the the United States of American is what matters.The nation needs to come together during this time to pick a leader, and who ever wins, respect that leader. We need to become united as a nation, not divided. Over the past 52 years the United States of America has seen 9 Presidents call the White House home. Each of them brought their own unique quality to 1600 Pennsylvania Ave. and each would try to leave a legacy behind. It is debatable who is the greatest President of the United States was, but there is no debate as to who would leave the White House too soon before his legacy was still in front of him. The death of President John F. Kennedy would have a ripple effect on our nation in the years that followed his assassination, and we as a nation have always wondered what could have been. The many debates as to who pulled the trigger that day in Dallas has been written about countless times and the debate does not seem to be slowing down with time. As I entered into the world of JFK assassination research at a very early age, my understanding of what happened changed over the years. Not only did my opinion change as I was able to do more research but my writing changed as well. Almost two years ago I had just finished my bachelor’s degree in business management in hopes of being able to further my career in the field that I had been working in. As the academic advisor was trying to push me into going for my Master’s degree, I realized that maybe I should pursue the one area that has always interested me, History. So at that moment, I wanted to become a better writer, and a better researcher, in hopes of being able to finally write a book about the JFK assassination. The journey would take two years to complete, but at the end of my of Master’s program I would be able to write my final capstone paper. Over these last two years, I have been unable to write many blog posts because of the amount of schoolwork that was in front of me. But here I am, ready to finally write about the topic that has garnered my interest since I was 8 years old, and it would put the finishing touch on my Master’s degree. As I have been debating what to write about for this massive writing assignment which will turn into my first book, the vast amount of stories about John F. Kennedy’s life and assassination, have been written about. So instead of writing about a particular theory or story about something that happened during his life, I have decided to look at how history has written about JFK. From the side of both conspiracy theorist, lone gunman theorist, and those who write about his life. In my collection alone, I have over 130 books about both his life and assassination, and since 1963 the history of the topic has changed. The story which started with the making of Camelot, to who else could have pulled the trigger, to the dark side of Camelot, and finally back to the legacy and impact of JFK, has ruled the history books of the life and death of our 35th President. The JFK assassination was a pivotal moment in the history of the United States of America, and the outcome of it, would shape the nation for decades to come. The hope of a nation may have died that day in Dallas as well, as the country has looked for the kind of leadership that JFK provided. Whatever your journey has been in the research about either the life of JFK or the assassination that cut his life way too short, I would invite you to comment below and tell everyone what made you want to read about him or the assassination. What caught your attention either as a child or an adult? As a new generation of researchers emerges, I hope to be able to keep the flame bright on the memory of JFK and have another generation of researchers look into the truth about what happened on that day in Dallas. As the date November 22nd comes onto our calendars, there are some of us that know the meaning of this date in history and others will go about their day like normal. It was on this date 52 years ago, that President John F. Kennedy lost his life and with it the hope of a nation that had counted on him to lead us into the new frontier. I was not born during this time in history but it was passed down to me from my grandmother who understood what his death would mean to our nation. From newspaper clippings, to framed pictures, to books, and finally a note from heaven, she had kept these mementos tucked away in a file underneath her bed. On the 25th anniversary of his death she brought out these mementos to show me since I had an interest in history. As an 8 year old boy, seeing your grandmother get excited talking about him made me generate more of an interest. 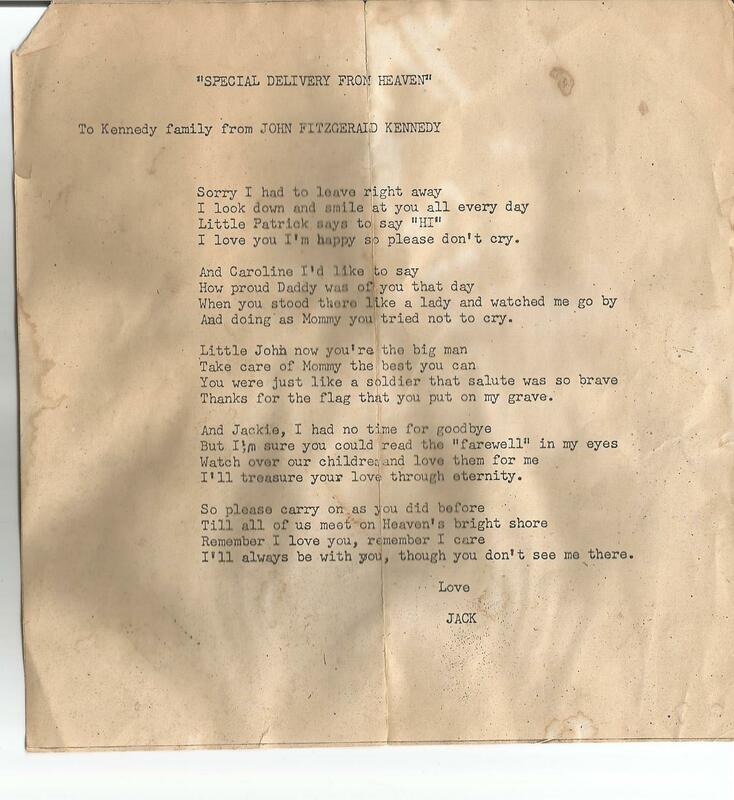 One of those mementos is pictured below, and the poem titled “Special Delivery from Heaven” was meant to comfort the Kennedy family and to assure them that they would be okay. The 8 year old boy thought this letter actually came from JFK himself, and a grandmother who did not want to tell him the truth. I have kept things like this not only to remember JFK himself but also the memory of my grandmother. It was the hope of not only her generation that JFK would be the one to lead us on a path that we were destined for but the generations that followed. We have looked for leaders like JFK ever since his death, and although some claim to have the same wit, charisma, leadership, and hope, none of them have been able to follow through. This date in history is important to always look back upon because it changed the lives of many, and the path of the United States. It is easy to also get caught up in the “what could have been”, instead of the “look what we had”. I believe that’s how JFK should be remembered, and the anniversary of his death should be a testament of what he did, instead of what he could have done had he lived. We as individuals look to people to inspire us to achieve great things, and with him we had a leader that told us to go for it. From an early age I taught my children about this day in history and every year I had to remind them of what happened on this day in history. That has changed, and now my children come up to me and tell me what day it is. It is important to remember these historical dates and pass it on to the future generations, because without history we will never know where we came from and who got us there. It was President Kennedy that pushed us to the moon, and now it’s time to reach for the stars. The story has been told many times over the past 52 years and yet we are still able to find bits and pieces that we may have missed. When I was 8 years old, my grandmother had a collection of JFK material stored in a metal container. One day when the interest of JFK was beginning to spark, I found myself going through this container. Inside of this container was a vast amount of newspaper clippings, notes that she had written down about this time in history and one book. That book was “The Death of a President” written by William Manchester. It was my grandmother that told me that this should be the first book I read about this time in history and should be my last. I guess to her, this was the true story about what happened during those dark days in November. Although to some, the story of those days may be different then what Mr. Manchester wrote about, he does the job of a historian in bringing the reader to that exact time and giving you a sense that you were there. I have read this book several times over the years and recently as I have been trying myself trying to be a better researcher, have looked a little deeper into the writing of William Manchester’s signature work. In this post I will not go into the entire story that Manchester was trying to give the reader, instead I will showcase some points that stick out the most to me. One of the main parts of the book that sticks out to me is the lack of cooperation that Lyndon Johnson had in the interview process. As William Manchester was gaining information from many of the key figures that were there that day, including that of First Lady Jackie Kennedy, it was Lyndon Johnson that showed the most resistance. During the course of the interview process, on two occasions President Johnson accepted the invite, then it would be canceled at the last minute. Eventually the two men would come to an agreement that President Johnson would only answer written questions and his responses would be done the same way. As Manchester states, “Some of the replies were detailed; to other inquiries he had no comment.” During the course of this reading, it appears that Manchester had become annoyed by the fact that Johnson was unwilling to recollect his memories of that day, and Manchester states that “It should be added that he has not seen the book in any form”. The frustration with Johnson was evident, but as the reader continues on in the book, it seems rather odd that the first 6 pages of Manchester’s recollection of the days leading up to the assassination and the days following it, involved talking about the Vice-President’s role in the administration and frustrations during his time as Vice-President. Within the first paragraph in the definitive recollection of the assassination of John F. Kennedy, the topic was not about the days leading up to the assassination, instead it was the role of the Vice-President and his frustration with the administration. It would almost seem to the reader that the agreement that Manchester and Johnson formed in order for him to be interviewed must have contained some form of understanding of how this book was going to begin. The political situation in Texas during the fall of 1963 was in ruins as the Democrats were coming apart at the seams. But as Manchester states in that first page, “Johnson would guardedly recall that there had been some discussion of the Texas political situation”. How is it that the main reason for the Kennedy trip to Texas was to restore faith in the party, and Johnson only recalls some discussion? The picture of resentment that Manchester was portraying of Johnson was coming clearer as the writing continued on. As Manchester states, “Johnson had found that he was a stand-by without a script”. Although he may not had the script he wanted, he did find himself thrust into a role that he want. On November 19th, 1963, Lyndon Johnson would take a trip to Dallas to speak with the American Bottlers of Carbonated Beverages. Only 3 days before the President was to arrive in Dallas, and at the same convention that former Vice-President Richard Nixon was at during his stay in Dallas during this time . An interesting side note to a story that has not been fully told. The Vice-President did not have many of the luxuries that were enjoyed by the President, and simple things like having a number not in the public directory was one of them. If Johnson was to go on a flight using a military plane it would have to be assigned to him and he would have to ask permission for that plane. An indication that Johnson was feeling left out of the circle was evident, and as Manchester states “Lyndon Johnson was, in short, a prisoner of his office.” The book that would be able to tell the story of the assassination of John F. Kennedy was beginning with the frustration of his Vice-President. However we want to take this we can look at a quote that William Manchester says in the introduction of this book, “In time I myself shall merely become a source for future historians as yet unborn”. This book was the beginning of my understanding of those days in Dallas, and 48 years after its publication, this book is a reminder that we need to continue to research and look for those clues that might help us better understand what happened that Friday in November. Manchester, William. The Death of a President, November 20-November 25, 1963, New York: Harper & Row, 1967. Peppard, Alan. “Kennedy Rival Nixon Left Dallas as JFK Arrived in November 1963.” Dallas Morning News. November 2, 2013. http://www.dallasnews.com/news/jfk50/explore/20131102-kennedy-rival-richard-nixon-left-dallas-as-jfk-arrived-in-november-1963.ece. As the years and months go by since the assassination of President Kennedy, we as researchers find ourselves looking at the same material over and over again. Was there something that we missed? Could I have overlooked something? Questions like this will continue to linger on for years and decades to come, but there might be some truth in the overlooking aspect. There has been many research topics available for people to read about regarding the assassination and some point in either a direction of a lone gunman or a conspiracy. As my development into a historian continues, I am trying to make it an effort to show both sides of the story. I want to provide pieces of material for people to read and to make observations based on these findings. The latest finding that I was able to uncover centers around a man named Robert Taylor. Many people may not even be aware of Mr. Taylor’s story and how he is linked to the assassination. In March or April of 1963, Mr. Taylor, who was a service mechanic at a Shell gas station in Irving, Texas, purchased a gun from an individual who came to the station. The story goes, that two men came to the station to get their 1959 Chevy looked at because of battery problems. When Mr. Taylor informed the men that the price would be $11.50 to fix the generator, the men offered to sell Mr. Taylor a rifle instead. They did not have the money to cover the cost of the repairs and the passenger in the car offered the gun for $12.00 to Mr. Taylor. The driver according to Mr. Taylor said, “You’re not going to let it go for that. You paid $35.00 for it”. It is important to note that Mr. Taylor believed that the person in the passenger seat was Lee Harvey Oswald. The man in the driver’s seat was described by Mr. Taylor as a white male, about 20 years of age and with a thin face. The man that Mr. Taylor was describing was Buell Wesley Frazier, although it is never mentioned in any of the F.B.I reports or even in the Warren Commission testimony that Mr. Taylor gives, no mention of the driver is ever mentioned again, besides in the original statement given to police. It is worth noting that Buell Frazier owned and still owns the 1959 Chevy Bel Air that he was driving when he would take Oswald back and forth to work each morning. 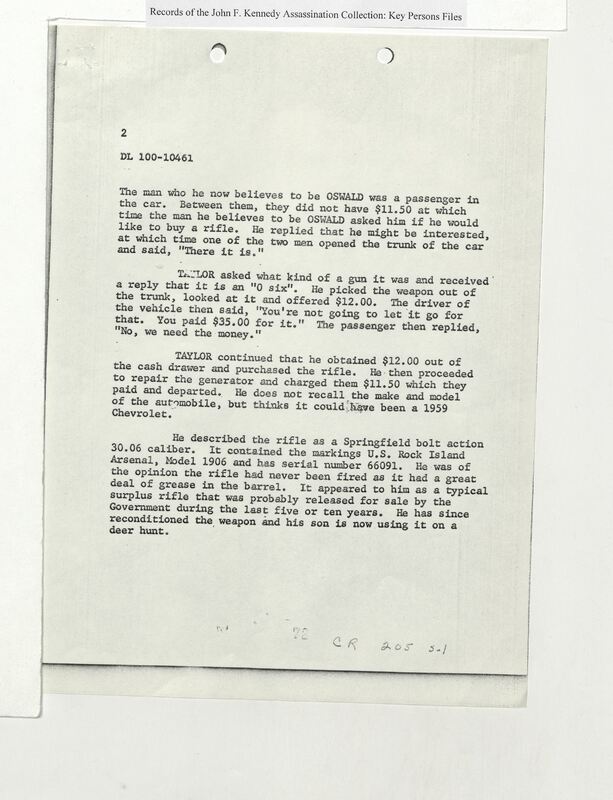 The mechanics story is much more than about purchasing a rifle from Oswald, it shows that others could have been with him as well. 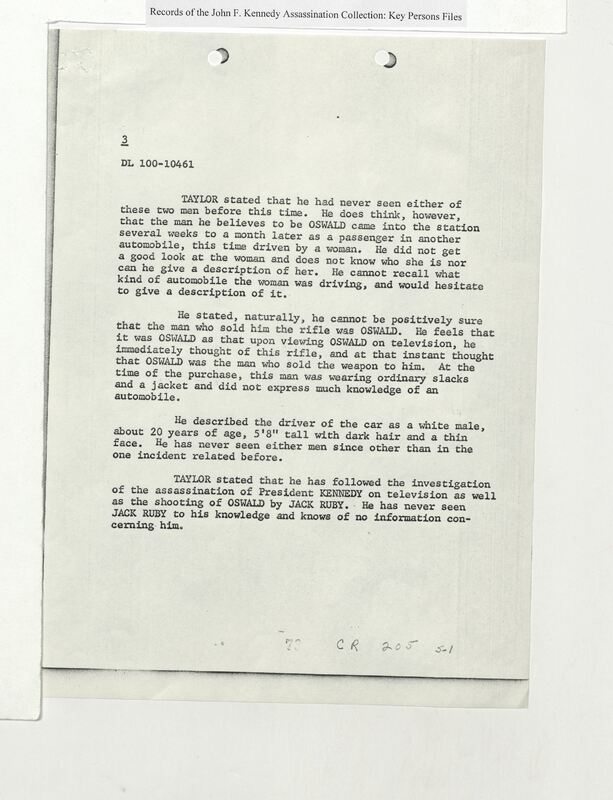 The car that Frazier drove each day, also had battery problems and he states this in both written and oral presentations about the activities before the assassination. As Frazier describes how he had to stay in the car to keep the battery charging while Oswald reached into the back seat and retrieved the “curtain rods”, we should think back to that gas station incident in March. Everything in this world can be looked at as a coincidence, but when you have two individuals matching the descriptions of both Oswald and Frazier months before they say they actually met, shows us there is more out there to look at. Another man at this same gas station, Mr. G.E Smith, was not working at the station at the time of the rifle purchase but had heard about it. In his statement to police and the Warren Commission, he tells of a story involving a woman who drove a 1957 station wagon. Mr. Smith says that this woman would come to the station on several occasion to get her car looked at. There was a time when he fixed this lady’s car and offered to take it home for her, and he even helped bring her groceries inside of the house. The woman who had children inside of the house, mentioned that the children in the house spoke better Russian than they did English. The address of this house was 2515 West Fifth Street, and we know that Ruth Paine lived at this address. Mr. Smith did not know the name of the woman, only that she had come there several times before. So, we have evidence that shows that Ruth Paine would go to this station to get her car fixed and even had the serviceman bring it home for her. It is very possible that having the car trouble that Mr. Frazier had with his own car at that time and he admits it several times, Mrs. Paine told him about the Shell gas station. 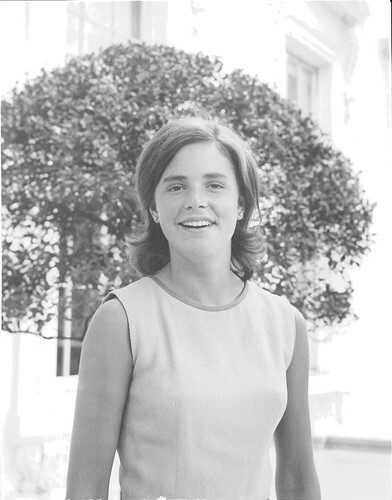 The Warren Commission did do an interview with Mr. Smith regarding the situation with Mrs. Paine, but in typical form, failed to address or even go into further detail about her being at the station. 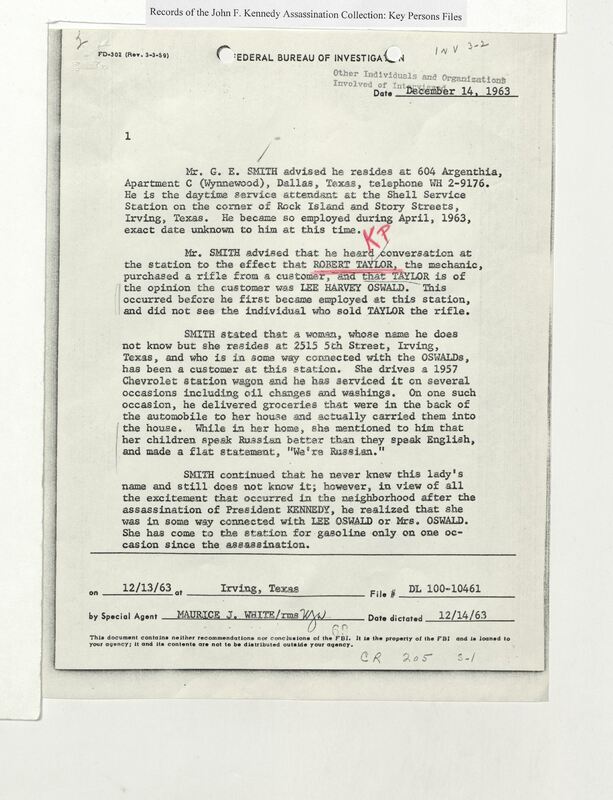 They also did not put Mr. Taylor’s statements into the finding because they believed that he was misidentifying Oswald in the car. The dots are there if they wanted to connect them and yet they failed to push it further. More indication that the investigation did not fully cover everything to uncover the truth. Although we get the opportunity to look back at things and see it from a distance, it is not hard to connect that Ruth Paine visited this same gas station on multiple occasions that Oswald and a man that fit the description of Frazier were at. The issues with the car that Mr. Taylor serviced that day, were in fact the same problem that Frazier had with his own car. It is all about showing the people information, and every day the research community looks for things like this story. National Archives. Accessed January 29, 2015. http://media.nara.gov/dc-metro/rg-272/605417-key-persons/taylor_robert/taylor_robert-0006.jpg. The truth remains out there!! As the anniversary of the assassination of President John F. Kennedy approaches, we are reminded of the day that changed the United States in so many ways. Ever since that day in Dallas, we have a tendency to speak of the “what if” aspect of the Kennedy administration and the policies that would have followed had he survived that day in Dallas. As researchers of the Kennedy assassination we follow that “what if” term as if it is our rallying cry as to finding out the truth. So many “what ifs” exists today about the presidency of John F. Kennedy, that it can be sometimes overwhelming as to the landscape of this country had he lived. The term “what if” will continue on, until the actual truth is revealed and as researchers we are committed to finding out the truth. Each of us has taken on a particular segment of the assassination that interests us, and by coming together with our research, we will one day find that ultimate truth. My research has been focused on an organization called the Acme Building Maintenance Company. This company provided the overnight cleaning of the Texas School Book Depository (TSBD), and they were present the night before the assassination of the President. Like I mentioned in previous posts about this company, there were two employee each night that had keys to the TSBD, so that they could gain access to the building once of the employees of the building had left for the day. In other words, these an all access to the building the night before the assassination, and could set up a potential snipers nest, or a staged snipers nest for that matter. In digging deeper about this company, the Warren Commission decided very early on that this company did not matter and throughout the entire report, there is not one mention about this company. Only in a report about TSBS supervisor Roy Truly, is the Acme Building Maintenance Company mentioned, and it is one line, on his report. So who really was this company that no one decided to look further into? The owner of the company was a man named Frank C. Jones, a prominent Dallas businessman, who over the previous 40 years had built up Acme Maintenance into one of Dallas’s largest maintenance companies. Throughout the city and especially the high rise buildings of downtown, Acme Maintenance was there, with the keys in hand. So what role could this company have played in the assassination of President Kennedy? For one, the luncheon at the Dallas Trade Mart was put together by the Dallas Citizens Council. This council consisted of the leading businessmen inside of Dallas, and to this day remains a force within the Dallas community. So, here we have the leading business people inside of Dallas putting together the event for the President and his wife, and yet it would seem that none of them truly expected him to arrive or at least one of them knew he wouldn’t arrive. When inquiring about Frank C. Jones with the Dallas Citizens Council, they acknowledged to me that the name was in their registry of people who have been part of the organization, but were unwilling to provide with me any documents that I may use. This is an organization that is made up today of some of the leading companies in the United States and to protect themselves, they would not let me know any more then I needed to know. Everything about the Acme Building Maintenance Company is sketchy at best. Through documents obtained through the Secretary of State of Texas, the company was sold to ARA Building Services in early 1964 and was quickly blended in with this organization. The listing for Acme Building Maintenance went to an individual by the name of Edwin Hudson who formed a new Acme Building Maintenance in the summer of 1963, and once the merger between Acme and ARA went through, he applied for an incorporation listing through the Secretary of State. However, this new Acme Building Maintenance Company was never truly a real company, as the address that was listed as the headquarters of this company was and still is, in a residential area of Austin, Texas. It is my belief that the Dallas Citizens Council used Frank C. Jones and his real Acme Building Maintenance as a means to find the best possible shooting angle for the eventual assassination. Once the job was finished, they already had in place a company to buy him out, and hide his company for good. Although I am still in the early stages of research with this company, I believe that there many people in the Dallas Trade Mart at the time of the assassination, knew that the President would never be arriving at his destination that day. We must continue to research the JFK assassination until the truth is finally told to us, whether it be 5 years from now, or 50 years from now. Our country changed that day in Dallas, and it left us with too many “what ifs” about a man who had the vision of what he wanted to accomplish with his time in office. It has been nearly two months since I wrote my last post on this website due to many reasons. The main reason for the lack of posts, is because I have now entered into my graduate program with a focus on American history. I am hoping that by being able to get a better understanding of how history was written and talked about generations ago, I will in turn, be a better writer and researcher myself. My goals are to be able to find research and tell it in a way that shows people, things they may have not known before. The purpose of this site is not to try and figure out exactly who killed John F. Kennedy, but it is to inform those who may be new to the research. Along the way, I have found some new research that I have shared and I have repeated some of the research by others. The assassination is a moment in time where everything stopped for a moment, and it is up to the research community to tell the story of what happened. We may all have different opinions as to what happened that day in Dallas, but we can agree that it changed our history forever. I myself, is continuing to push forward and looking for material that others may have overlooked or their voice was just not heard loud enough. Below is a sample of what I have been writing in my class, and of course the focus is on John F. Kennedy. 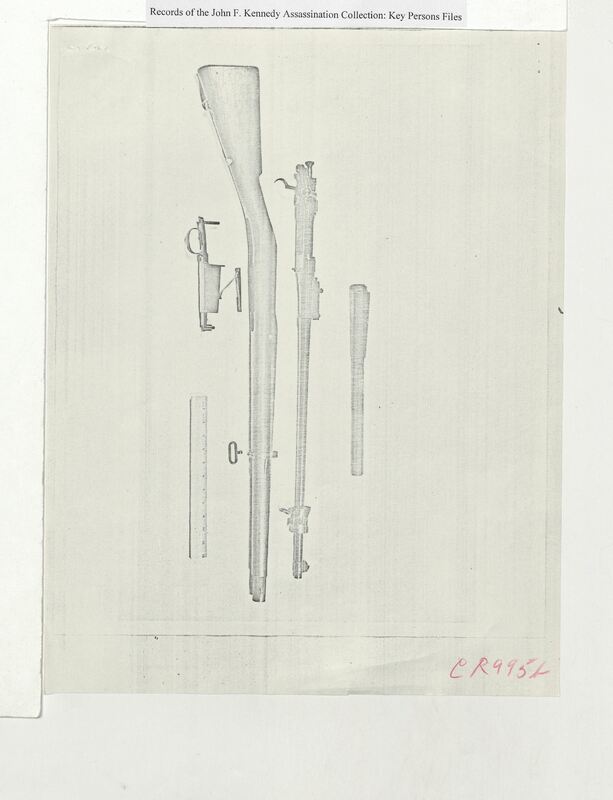 It is not the typical assassination research, instead it is about learning the history of the research itself. Throughout time, there have been many moments that have been cast as life-changing, but few of them can compare to the events that transpired on November 22nd, 1963. For the people that remember the day that President John F. Kennedy was assassinated it was not only a day that changed the course of history but also a day they would never forget. The assassination of the President of the United States had occurred 3 times prior to 1963 and yet the void the nation felt from this assassination had not been felt since the assassination of President Lincoln in 1865. The assassination of President Kennedy was one of the biggest moments of the 20th century and yet today it still remains an unsolved crime to some. The historiography of the assassination has taken many different turns in the 50 years that have past and many historians have taken their shot at figuring out the unofficial “Crime of the Century”. Although the authorities singled out the man they thought was the assassin, the general public seems to think that a larger plot was involved in the assassination. History has shown us over time just how the nations opinion on this manner has changed. For the young readers of today’s generation, it is important for them to understand that the assassination of President Kennedy changed the shape and course of our nation. The Vietnam War was not a war yet, man had not been on the moon, and African-Americans were not given the freedoms and equality in the Civil Rights Act. These specific events were all things that were on the agenda of President Kennedy before that day in Dallas and our history as a nation changed from that day on. Many Americans look back to the Kennedy assassination as a turning point in our nation and that is why after all of these years it is still a topic that is mentioned and talked about today. Learning about what actually happened during those last few moments on Elm St. in Dallas has evolved over time and each author brings their own version to it. The official story of the events that day are that one lone gunman named Lee Harvey Oswald was able to assassinate the President of the United States with a high powered rifle from the sixth floor of the Texas School Book Depository. In December of 1963, President Lyndon Johnson appointed a commission to look into the details of the assassination and to come up with a conclusion. The report, named The Warren Report (based on the commission’s leader, Earl Warren) concluded that in fact Lee Harvey Oswald acted alone. Since the day, the Warren Report was released the history of the Kennedy assassination began to take on a life of its own. Many authors and researchers were giving their opinion on the manner and over the years countless books have been written about the assassination, whether they believe the Warren Report or whether they believe someone else committed the crime. When published in 1967, Rush to Judgment by Mark Lane was received with mixed reviews. Our trust in government was fading through the events that were happening in the decade, and the full truth about the Kennedy assassination was still a topic of discussion. When the Warren Report was released in 1964 many Americans believed that version of what happened that day in Dallas. It was very common to believe what the government was telling you was nothing but the truth, and with the assassination of a President you would hope the truth would be told. In his book, Lane examines countless witness testimony that was left out of the final report by the commission and determines that someone other than Lee Harvey Oswald was the true assassin of the President that day. 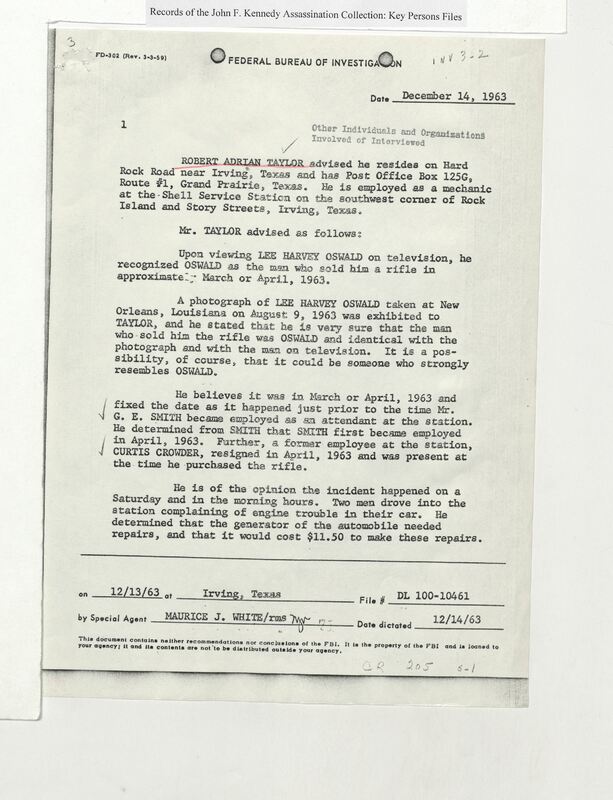 By describing the other key witnesses to the crime, he is able to break down a timeline of events that shows that Oswald was not alone in this plot. The book has become a cornerstone for future researchers to look back upon. The research done by Mr. Lane was groundbreaking at the time and to go against what the government had said about the assassination was even bigger. The book has led to many more researchers to give their own version of the assassination. To this day the Kennedy assassination is still a highly debated topic with more Americans believing that more than one person was involved in the assassination plot. For once was a strong opinion of a lone gunman, has turned to a “whodunit” mind frame. The conspiracy theories have carried on over the years and Mr. Lane is still right in the middle of all of them because of the work he did back then. This is just a sample of some of the papers that I have written in my class and I hope to continue to write about the assassination in future classes. Although some of the information is repeated, their is still plenty of materials that have yet to be looked at. In the coming months I will continue into the research of the Acme Building Maintenance Company and its owner Frank C. Jones and to get a more clearer answer as to what happened to the company that had keys to the Texas School Book Depository the night before the assassination. Bugliosi, Vincent. Reclaiming history: the assassination of President John F. Kennedy. The New York: W.W. Norton & Co., 2007. Company, Inc. The official Warren Commission report on the assassination of President John F. Kennedy. Garden City, N.Y.: Doubleday & Company, 1964. Lane, Mark. Rush to judgement: a critique of the Warren Commission’s inquiry …. Greenwich, Conn.: Fawcett Publications, 1967. Salinger, Pierre, and Sander Vanocur. A tribute to John F. Kennedy,. Chicago: Encyclopedia Britannica, 1964. Photo Courtesy of rgs6 via flickr. Today marks the 97th Birthday of President John F. Kennedy. Today is a day to remember a person who meant so much to so many people around the world. We spend a lot of time trying to figure out the real assassins in his murder and it is sometimes overlooked on the impact that he had on people then and still does to this day. This site is dedicated to some new and old research into his assassination and I think that on this particular day there should be no talk about that and more about the legacy of JFK. As the years have past since 1963, the world seems to forget about certain days like this and the next time the media will pay attention to remembering JFK, will be around the time of his 100th birthday. To the many researchers and admirers of John F. Kennedy this day is a day that we would like to see become a National Holiday. The story of John F. Kennedy has been told many times over the years in the countless amounts of books and a variety of movies. What I would like to talk about today is the impact that he still has on the many Americans who lived during that time and to the young Americans who inspire to like him. We have searched for a President like him and have looked for his characteristics in all of them ever since his assassination. Almost every democrat that runs for President of The United States feels the need to plug in some sort of JFK characteristic into their campaign. For instance, the last two democrats that ran for President have tried this tactic, John Kerry and his ties to the Kennedy family, and his initials being JFK, and President Obama using his Presidential campaign and his endorsement by Caroline Kennedy to show America that Camelot would be back. To the people that remember President Kennedy in office, they remember a President that was fearless and when it came down to making a decision he would take the advise of his best advisors and make the best decision for the country. To the many Americans today who only were able to read about JFK in history books, the thing that sticks out is his inauguration speech. As students we learn the phrase “Ask not what our country can do for you, ask what you can do for your country”. My children are just now learning about JFK in school and they asked me what that saying meant. My response is that JFK wanted us to take pride in our country and not let the country always be the one to take care of you, but as people what we can do for each other throughout the country. The idea of Camelot is something that was started 50 years ago and it is something that will carry on for another 50 years and beyond. The time of John F. Kennedy was one of hope and passion, and the country believed in our government. If you are to watch some of the press conferences and television debates of the 1960 Presidential Campaign, you will see some of the same problems we had then are the same today. But there was a belief and a hope of change, and that a President who had the passion and willingness to make the right decisions will get it right. President Kennedy was not the perfect President nor was he the perfect man. We all have our faults and weaknesses, but it is how we react in tough situations that make us who we are. We saw that in President Kennedy, and we want that today in our leaders. Sometimes we look for leaders that need to be perfect in every which way. They need to have the perfect education, perfect marriage, excellent health, in order to be a great leader, and yet JFK lacked in many of these areas and we never knew it. We saw his actions in the battlefield both in World War II and in the Oval Office and that’s what makes him one of the most beloved Presidents of all time. Kelley, K. (2013, January 23). Obama and the Legacy of Camelot. . Assassination Attempt That Went Unnoticed.. Throughout history there have been many different assassination attempts on the life of the President of the United States. Some attempts have been successful and others go unnoticed. But when a President of the United States is assassinated and a commission is set up to investigate the assassination, why are they not looking at the other attempts on the President’s life. President Kennedy was the victim of several different assassination attempts, including one that was one month after his election. However, there was an attempt that the government never wanted the public to hear about. To no surprise it was also excluded from the final Warren Commission report delivered to President Johnson. It is important to learn about the back story of how this information got out and who leaked the information. 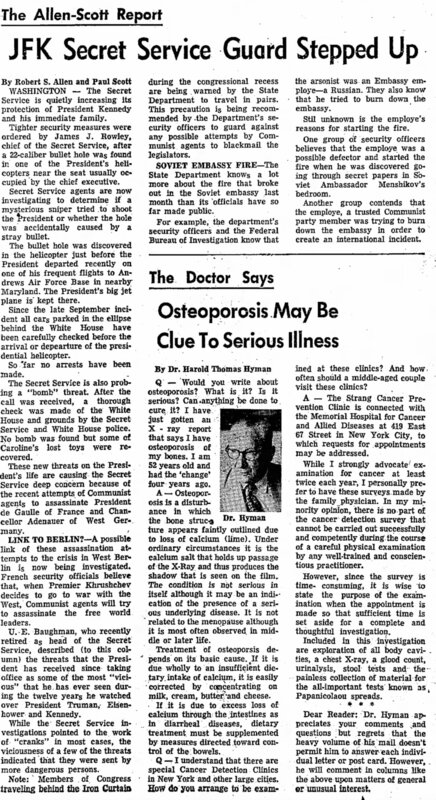 The story titled “JFK Secret Service Guard Stepped Up” was published on October 5th, 1961 in newspapers throughout the country by syndicated columnists Robert S. Allen and Paul Scott. These two men would write about the in and outs of politics in Washington D.C. The accuracy of their stories would go unmatched for years because of the sources that these two men would use. Their articles were becoming so accurate that Attorney General Robert F. Kennedy ordered a wiretap at the homes of these two men. Because the information they were writing about was so classified he wanted to know who was giving them the information. The operation which fell under Project Mockingbird, in which it was discovered that the conversations that these two writers were having was with several key members inside the government. Some of these sources included 12 Senators, 6 members of Congress, staff member at the White House, Assistant Attorney General, and a member of the Vice President’s office. This also does not include the several well placed individuals the report mentions as sources for these two writers. A CIA memo that was released in 2007 describes how the Attorney General wanted this wiretap and the results of the wiretap. I have included a link to the memo at the end of this article. So know that we know that the sources of the two writers are of value, then we can look at their articles with full confidence that they are speaking the truth. Back to the article about the failed assassination attempt on President Kennedy, this occurred sometime in late Sept. 1961 and the article was written in early October. In the article it states that before the President was getting ready to board Marine One ( Presidential Helicopter) the secret service noticed a .22 caliber bullet hole in the seat in which the President normally occupies. The secret service was trying to figure out if their was a ” mysterious sniper” according to the article. As of the printing of the article no arrests were made and they were trying to determine where the bullet came from. How can a piece of information like this go unnoticed by the Warren Commission? I know how, they never wanted to look further into the events that lead up to the assassination and only wanted to fuel their own fire. But an attempt like this should have been looked at more closely. This attempt could have been done from someone on the inside and the finding of the investigation covered up. I tried looking up more about this assassination attempt and was unable to find anything else about it. The writers of this story never go back to it in later years and it is pretty much off the radar. Considering that JFK was assassinated by a sniper, this kind of information could have helped the Warren Commission out. This story is just one of many that are out their to find, if we spend the time looking for them. The writers of this article would spend the rest of their lives under the assumption that they were being watched and finally in 1981 Robert S. Allen took his own life. Paul Scott would go on to live a long life, but not without worrying about the government watching him and his family. The people that knew too much and were trying to tell us the stories inside of Washington D.C, somehow found themselves in a situation they could not get out of, and along the line they were finding out information they should not have known in the first place. Digging Deeper into the JFK Assassination. Well, it has been a while since my last posting because of a much needed job promotion and now that I am finally settled in, its time to get back to the research. In the last post I wrote, I mentioned a company by the name of Acme Building Maintenance. This company was a janitorial company that specialized in cleaning the high rises of downtown Dallas. The company was well known in the city, and over 200 companies in downtown Dallas used them as their primary cleaning service. 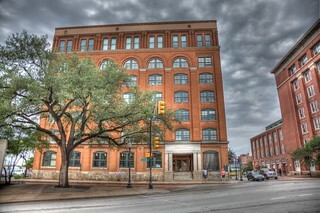 The company the was founded in 1920 by Frank C. Jones was also the cleaning service provider of The Texas School Book Depository. In early Secret Service reports, the company is mentioned a few times. In his statement Roy Truly mentions that a cleaning service comes in after everyone has left the building and they have keys to the building for that reason. Seems odd that I was only able to find this company mentioned only a few times and none of which seems to be investigated really well. I have spent a few months looking into this company and learning more about their history and how they simply just disappeared. The founder of the company Frank C. Jones wanted to start a company that would be able to not only clean buildings but also the streets of downtown Dallas. A resident himself of the city, the company followed his vision of a cleaner Dallas throughout the next several decades. In articles published in the Dallas Morning News, the company is featured several times about how they go about their business and how they are able to maintain low costs. The names of the top executives are mentioned which include Milt Thomas, Paul Clark, Robert Whitener, and Buck Butler. The company was located at 1901 Laws Street, Dallas Texas ( It has since been demolished). What has troubled me while doing research on this company, is the fact that it simply disappeared. A company that had been around for 40 years suddenly went away, and any files on the company seemed to have gone with them. During my research, the Secretary of State of Texas, informed me that it seems that this company never existed because they had no information on it. I had sent several letters to the secretary of state, and they thought I had the name wrong. I emailed pictures of news articles that I had, and they told me to contact different organizations. The next step to finding out more about the company would be the Historical Society of both the State of Texas and the Dallas County Historical Society. Nothing to be found was what I was told. Again, I showed them the articles and they had nothing in their files. The company was featured in a Dallas Chamber of Commerce pamphlet in the early 1960’s and yet when I tried to get information about the company, they had nothing. Since these organizations claim that this company did not exist, I just kept digging away. I found an article from Sept 1969 that showed the company was bought out by CT (Chemtech) Corporation of Dallas. I keep finding articles about this company, but when I want to get more information about them, I am stopped dead in my tracks. When I was able to get a phone number of the business ( RI 2-7660), I went back to the Chamber of Commerce to see if that would help with providing me more information. Nothing. Trying to find out information about Frank C. Jones is just as hard as to finding out how much money is kept at Fort Knox. No one wants to tell you, but there are people that know something. A company that existed and was successful as the Acme Building Maintenance Company would leave behind some sort of trail, and yet this company seems to have been taken off the grid. The keys to the Texas School Book Depository were in the hands of the employees of the Acme Building Maintenance Company and yet not one employee was interviewed by either the Dallas Police, or the Warren Commission. The company is only mentioned in a few reports that seem to show just how easy it was to get into the building before the assassination. As I mentioned before, I believe that employees of this company were able to get into the building the night before the assassination and set up the snipers perch. We do know that workers on the sixth floor were installing new flooring, but yet no of them mention about moving those boxes by the southeast corner window. There was no need, these boxes were set up the night before with Oswald’s gun tucked away, awaiting for the police to find it. JFKennedy1963 is raising funds for further research across the country. A Legacy That Lives On.. The video that shows Lee Harvey Oswald being shot and killed in the basement of Dallas Police Headquarters. Dallas Police Chief Jesse Curry stated in his book that the television crews were not in their assigned area and that they rushed towards Oswald as he was coming out. Clearly the video shows that camera crews were set up waiting for Oswald and their was no rush to the suspect. “So, let us not be blind to our differences – but let us also direct attention to our common interests and to the means by which those differences can be resolved”. Oswald Seen at Rifle Range By Many Witnesses..
Marilynduaby on A Legacy That Lives On..